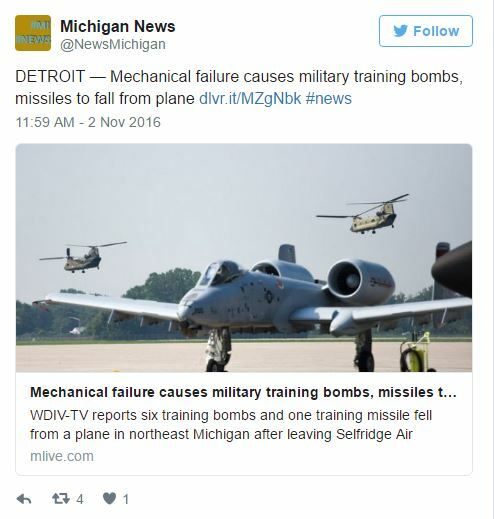 U.S. Military officials have confirmed that a National Guard jet accidentally dropped six training bombs and a training missile over Luzerne, Michigan on October 25. No one was injured as the bombs were training devices and landed in a wooded area in Michigan’s northern lower peninsula. The A-10 was traveling from Selfridge Air National Guard Base in suburban Detroit to Camp Grayling in Grayling Township, MI on a training flight at the time of the incident. It is believed that the aircraft involved was an A-10 Warthog due to Selfridge operating the A-10 as part of the 107th Fighter Squadron. Trumble also confirmed that the bombs and missiles were non-explosive and were designed to release smoke if detonated. NFL Wide Receiver Josh Huff On Firearm Charges: "What professional athlete don't have a gun?"